In late August Capt Andy and Rich hooked up with one of the sharpest cod fisherman in the Northeast, Capt Joe Huckemeyer of the famous Helen H out of Hyannis, MA. If you want to catch cod year round, Joe and the folks from the Helen H are the best choice.He and his partner Joe Wienberg, captain of the charter boat Fish Hawk, took us out into 200ft of water and we positively bailed the big fish. We had too many 20-30lb fish to count during one of the best cod fishing bites we have ever seen. This was a very interesting ride in our 24ft Edgewater. It was warm and flat calm on the way out, but when we reached the bank, it was way colder than any August day should ever be. it got a bit nasty on the way back, but we didn’t really care because the cod fishing was so good. We have done several shows with the guys from the Helen-H, and they were all fun (and the fishing was incredible). 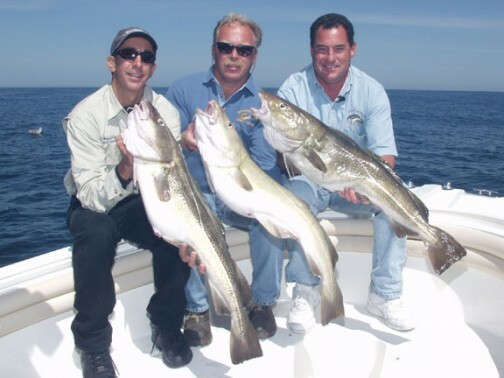 The techniques and tackle in this show can be used by anyone who target big deep water cod whether on their own boat, a charter, or an open boat. If you have questions about any of the equipment used during the show, please contact us. Click here for our Cod Tackle recommendations.